I took this appetizer to the April Ladies Fellowship at church last night. It was easy, delicious and we had NO leftovers!!! Heat oven to 350 degrees. Unroll dough and separate into 2 long rectangles; press each into a 12x4 inch rectangle. Firmly press perforations to seal. Sprinkle garlic powder and cheese over rectangles; gently press into dough. Starting with one short side, roll up each rectangle, press edges to seal. With serrated knife, cut each roll into 8 slices, place cut side down on ungreased cookie sheet. Brush tops with beaten egg; sprinkle with Italian seasoning. Bake 15 to 18 minutes or until edges are golden brown. Immediately remove from cookie sheet. In small saucepan, heat pasta sauce over medium heat until hot, stirring occasionally. Serve warm pinwheels with pasta sauce. I've done something similiar for breakfast. Mix cream cheese with cooked sausage and spread on crescent rolls. Roll and put in fridge. Then slice in pinwheels and bake. Yummy! Crescent rolls are so good for making easy dishes. OH YUM, Kim!! I am DEFINITELY going to make these with cream cheese and cooked sausage!!! That sounds FABULOUS and definitely something the whole family would love!! Oooo, I will make these for our next Ladies Group meeting. Hmm, these sound so good. Wish I could get the crescent rolls here. Still it's a great idea, I may modify it to a home made status! This looks really good! I will try this for one of my many meetings... Please check out my chicken teriyaki recipe! Mmm...they look delicious, Mrs. U! Thank you for the recipe! Those look SO good! I want some! I miss many things about Ladies Fellowship..and that's one of them! Hi! I found your blog through another blog and am wondering about the water pitcher you were giving away. Does it make ice tea? I went to their site and am confused. If you could give me a little clarification, that would be great as I love ice tea and drink it all the time but hate making it!!! Thanks so much. Love your blog!!! If you have any questions, in the upper right hand corner on adagio.com, you'll see "Email us". They are very good at getting back with you, so feel free to ask them any questions. Oh, and be sure and go to my right sidebar and register for a $5 gift certificate from Adagio (2nd advertisement from the top)! 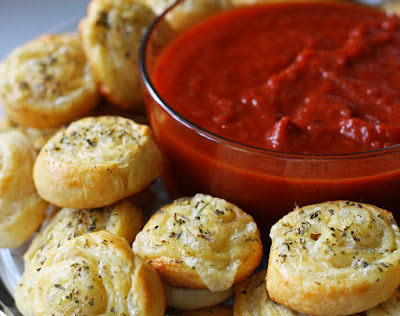 We make something like that called monkey bread where we take balls of dough and put them all together in a bunt cake pan, then you just tear them off and dip in marinara sauce.